When it comes to choosing anything, whether it’s a Christmas tree or a car, a bunch of bananas or a t-shirt, David and I have very different approaches. His is measured, careful, well-researched and thoughtful; mine is ‘I like that one, I’ll have it thank you very much’. We usually buy our Christmas tree together with at least one of the children in tow. It’s a family affair involving much standing around in the cold, holding up every tree, measuring it, looking at each one from all angles, discussing the arrangement of branches. I go along with this but have usually clocked the one I like straight away. This year, David is away and the children aren’t bothered, so I find myself at the tree nursery On My Own, a field full of fallen Nordic firs in front of me. I suss out where the 6-ft trees are (I’m not going to get sweary with a hacksaw this year) and pick one up, spin it around to check it’s ok, then carry it to the nice man with the wrapping machine. He kindly carries it to my car, I hand over the cash and Bob’s Your Uncle. It is now leaning up by the front door until the weekend when we will bring it inside, remove the wrapping and bedeck it with Christmas loveliness. I hope they like it. Watch this space. That’s so funny. I’m like your David and my Husband is like you! I drive him crazy with my picky-choosiness but he won’t get the tree without me. I’m itching to get ours, hopefully on Saturday. Maybe picky-choosy people go well with impulsive-decisive people. We balance each other out. Oooh, that’s my favorite kind of Christmas tree, and they’re hard to find around here. Mostly it’s Scotch pines here, which are very full and bushy. Have fun decorating! Every year I try to make it fun but I know that at least one of the children will go off in a strop and we’ll find the lights don’t work. I always love the end result though! Oooh, we used to have those tree decorating tantrums, too! Thank goodness they’re a thing of the past. This year about half our lights died, but thankfully a hardware store nearby was open, and that saved the day! 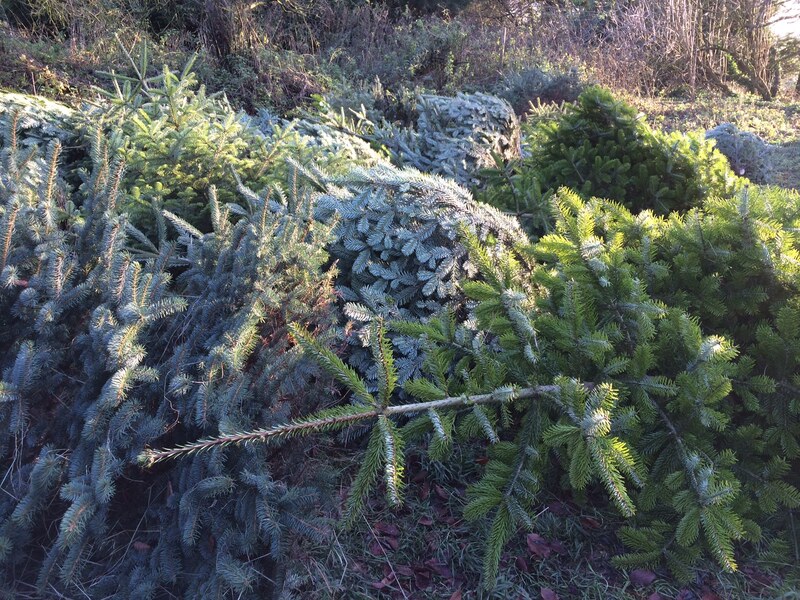 We usually cut our own Scots Pine Christmas tree, joining in to clear scrub from lowland heathland, a special habitat which is surprisingly common in Surrey. But this year I don’t think I’ll have time so we’ll go and choose our tree this weekend from Chilworth Manor where there is a small Christmas tree plantation which raises money for various good causes. I only ask that it is a Norway spruce, for the scent, and that its main stem is not too thick to go through the shredder! Have fun with yours this weekend. Good luck! Judy and I also have opposite approaches to shopping, except she is more like your husband. I walk in a store, look at the first item that bears some resemblance to what we are supposed to buy, and say: “That one is good.” She likes to mull things over. I used to send husband and children off together. I sat at home on the sofa and drank hot chocolate and flicked through Christmas lifestyle magazines warmed by the knowledge that all the stroppy business was going on without me getting involved. It was bliss. We have a Fraser fir this year for the first time as it is softer for inquisitive small hands and smells lovely. It is in a bucket of water in the garage awaiting its moment. I chose it pretty quickly. I think I’m getting less picky as the years roll by. Ooh, I shall look up Fraser fir in a mo. Will your small handed person be helping to decorate this year? How lovely. It’s interesting to see the other side of the counter! You wouldn’t believe how long some families take to pick a tree and how many arguments there are. I must admit that my favourite customer is the lone man who walks in five minutes before we close and takes the first tree he sees. That said, it would be pretty boring selling trees all month if everyone was like that. Looking forward to seeing the decorated tree in all its splendour. I’ve reverted to Norway Spruce because I love the smell and shape. We do sometimes step in to adjudicate! That’s why we leave ours outside for a while! Yes, you’re right, I will! but what if they don’t? will they buy another one and then you’ll have two. or will the moan and groan about it, and for years talk about “the year of the dreadful tree”. I don’t think I could cope with the responsibility…………..
Ha, yes, well… My middle son was totally unimpressed and did moan (it’s smaller than usual as I am trying to save money) but the others took it well. It might go down as the year that mum bought a bargain tree and we couldn’t fit all our decorations on it!